Just so you are aware, this blog and post are not affiliated with - and, therefore, not endorsed by - The Henry Ford (Greenfield Village and the Henry Ford Museum) in any way, shape, or form. It was created out of my love for the place as well as my passion for history. All of the written information here came from The Henry Ford in some form or another, much of it through the large collection of guidebooks I have acquired, the placards placed at each structure inside the Village, the historic presenters (current and former), books such as 'A Home For Our Heritage' and 'Henry Ford Museum & Greenfield Village: An Illustrated History,' as well as through my own personal research at the Benson Ford Research Center. I have tried to cross-reference all of the information to ensure its accuracy. 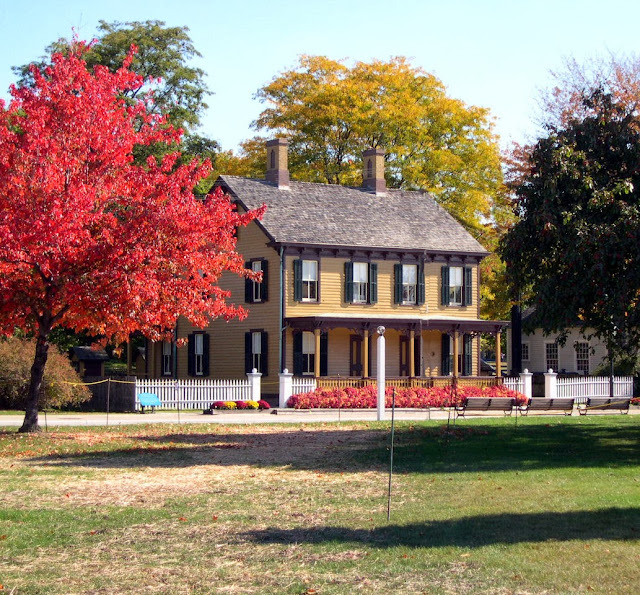 Please note: I do not talk about the school that Greenfield Village initially began as. That is a whole 'nother ball of wax. "Preservation owes a lot to Henry Ford. But in the process of making people aware of the value of the past, he made a number of mistakes. One that modern experts find most objectionable was his uprooting of buildings from their original sites, thereby stripping them of their historical context, all in the name of historical preservation." I've heard this argument countless times during discussions. I've also read newspaper and magazine editorials concerning this practice. And it never ceases to amaze me that some can't see the forest for the trees. Love him or hate him (and there are plenty of both out there), he has done such a service to history - American history - and I deeply appreciate it, for his accomplishments in this field have fed my historical thirst like little else. Henry and Clara both thought the rhyme came from one of the William McGuffey Eclectic Readers, first published in 1836. After a futile search to find which Reader it came from, and through it all amassing a complete collection of the 145 different editions, he found he had a penchant for collecting. He already had garnered a rather large collection of clocks and watches, which he loved to tinker with as a child. And, he had accumulated objects of his hero, Thomas Edison. 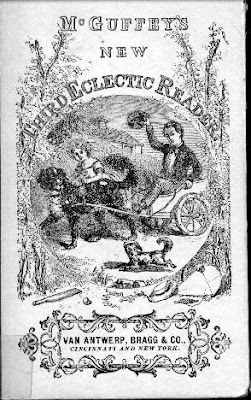 So the McGuffey Readers were just another extension of what was quickly becoming his passion. It was around this WWI era that, in part, due to his strong pacifism during that "Great War," a number of newspaper articles were published expressing Mr. Ford's anti-war sentiment, called him an anarchist, among other things, and quoted him as saying, "History is more or less bunk..." which has been repeated often ever since. What most folks don't know is that this "bunk " comment was stated for reasons other than what the press said. It is here that I quote from the book, A Home For Our Heritage by Geoffery C. Upward: "...what (Ford) meant and explained many times in later years was that written history reflected little of people's day-to-day existence. 'History as it is taught in the schools deals largely with...wars, major political controversies, territorial extensions and the like. When I went to our American history books to learn how our forefathers harrowed the land, I discovered that the historians knew nothing about harrows. Yet our country depended more on harrows than on guns or great speeches. I thought a history which excluded harrows and all the rest of daily life is bunk and I think so yet." 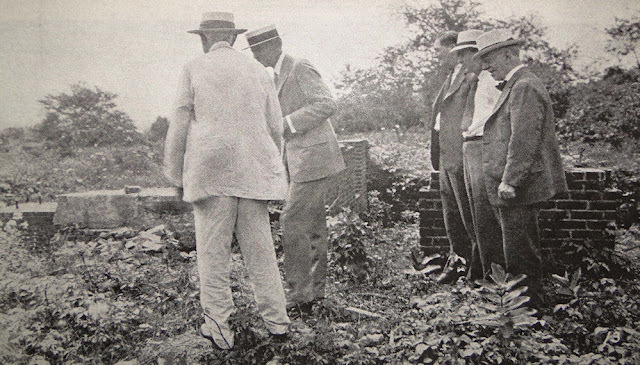 It was shortly after the war, in 1919, that Ford found that his birthplace home was in danger due to a major road expansion through the property of his family's farm. The house lay directly in the path of the road. Ford and family decided to prevent this awful occurrence by moving his house and barns out of harms way. But, they didn't stop there. They also restored the old homestead back to the way they remembered it being in 1876 - the year Henry's mother passed away. They searched high and low for every artifact that matched their memories and soon found many more items than necessary. Mr. Ford kept them all, and then some. 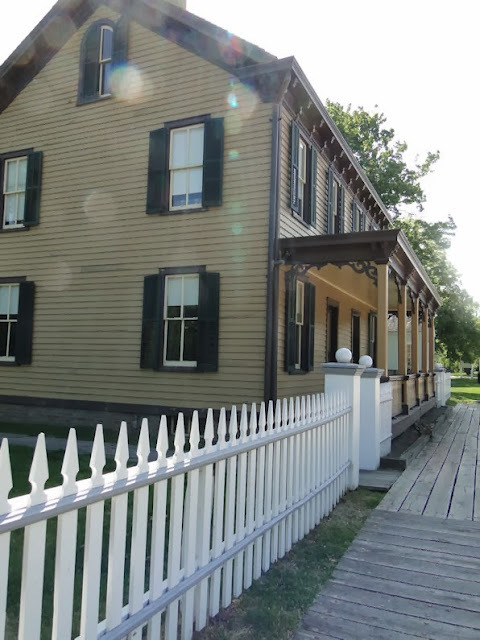 Not long before his death, Ford had his birth home removed to his Greenfield Village, where it still sits as an honor to the man who put the world on wheels. And how it looks restored today...just as it did over 150 years ago. According to numerous sources, the idea for preservation and the displaying of the everyday items he had (and continued to acquire) extended into the mid-1920's. 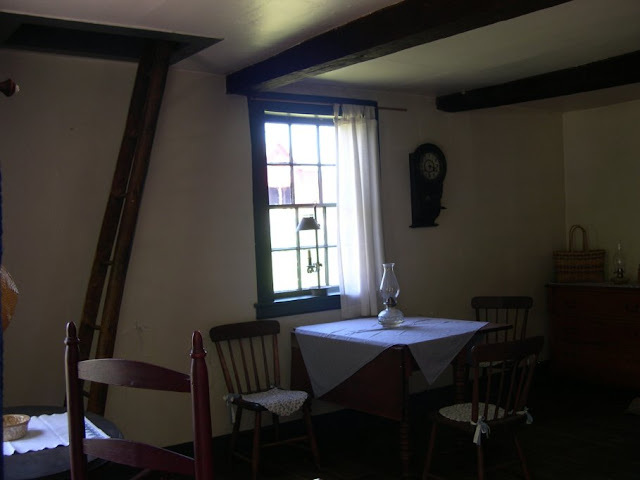 He was asked to restore The Wayside Inn in South Sudbury, Massachusetts, built in 1686. 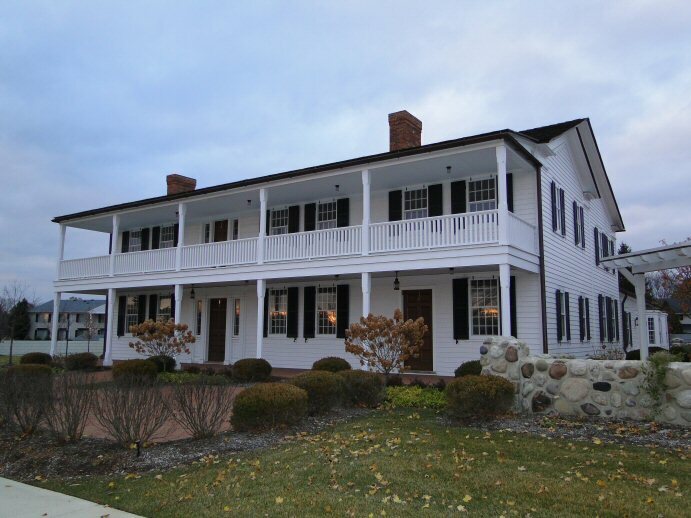 Well, when Henry Ford purchased the Wayside Inn in 1923, he envisioned transforming the old Colonial Inn into a living museum of American history, an interest that predates the development of both Colonial Williamsburg and his own Greenfield Village. Pursuing his vision to create a living museum of Americana that would be the first of its kind in the country, Ford purchased 3,000 acres of property surrounding the Inn, added eight new buildings to the site, and collected antiquities for display purposes. 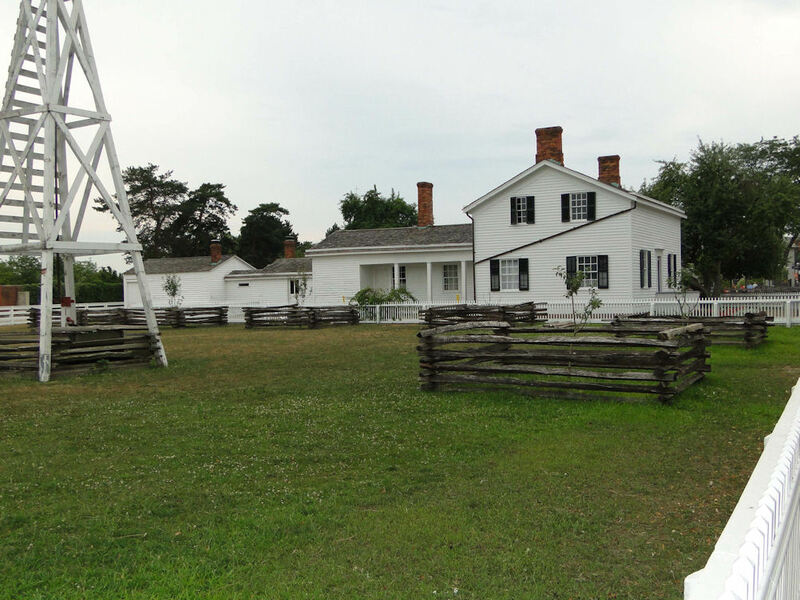 It was in this manner Ford could preserve the setting in which the inn was located as well. 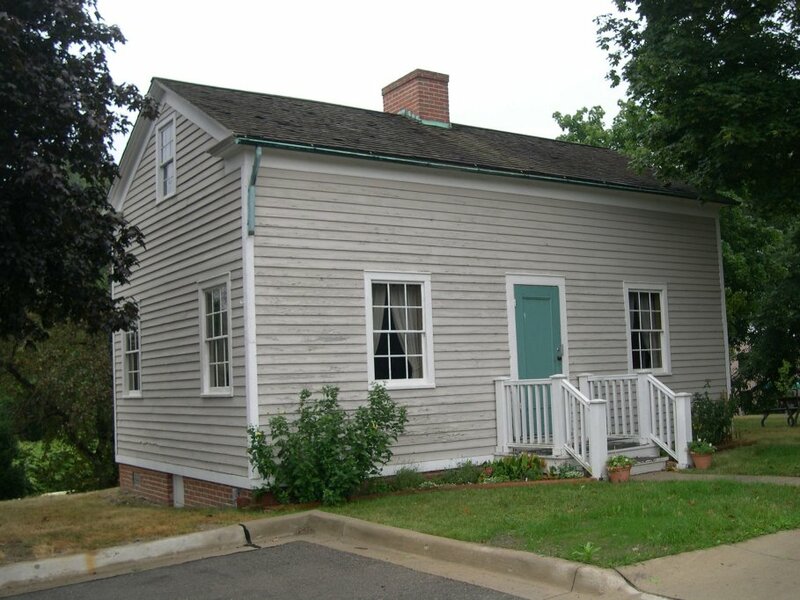 A very interesting coincidence in his preservation of the Wayside property included "one house, the circa 1700 Plympton House on Dutton Road, (which was) disassembled and moved to Greenfield Village." 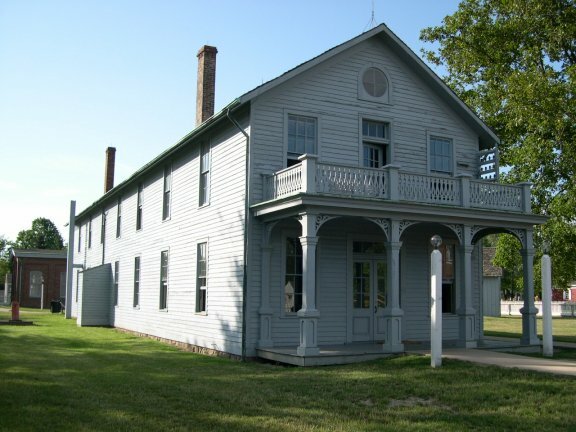 Henry Ford also purchased and restored the 1846 Botsford Tavern, located outside of Detroit. 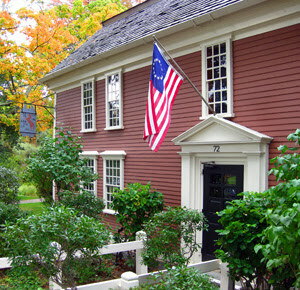 Ford had first seen the tavern while courting his future wife, Clara, in a horse and buggy in the 1880's. Ford and his soon-to-be-wife were regulars at the Saturday night dances and became good friends with the owner. In fact, according to the Detroit News (from 1925): Mr. Ford was always a favorite and no matter how big a crowd or how many guests, there was always a stall for Henry's horse. 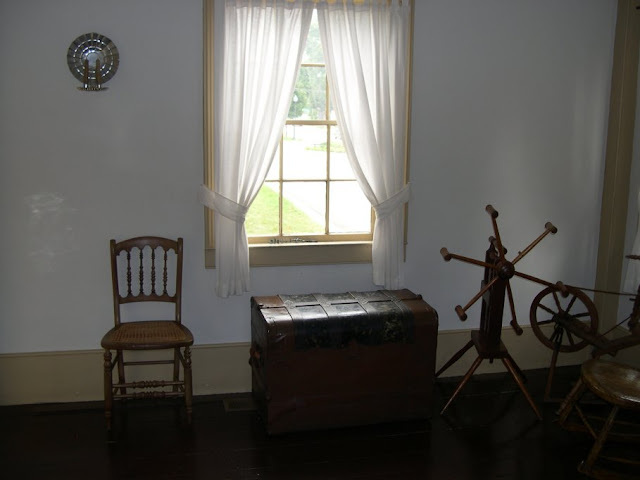 The "young Ford boy" was granted another honor by Mr. Botsford, and that was permission for him and his sweetheart to place their wraps in the parlor, a place reserved only for the intimate friends of the proprietor's family. This "young Ford boy" purchased the inn in 1924 and did extensive restoration, doubling the size of the ballroom, adding to the kitchen, and sprucing up the other rooms, all the while restoring them as close as he could to their original splendor. 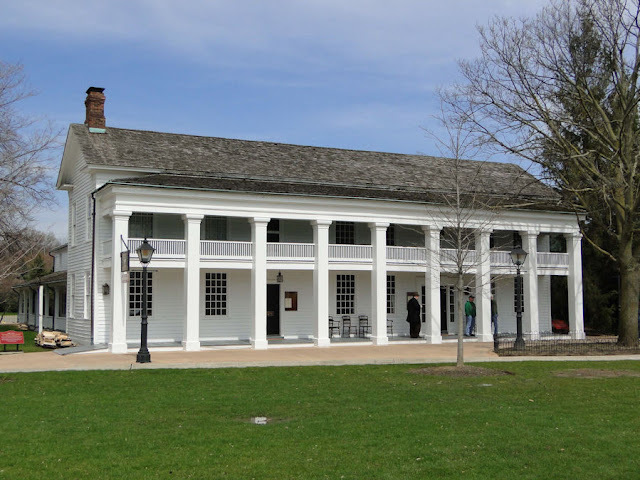 He, too, held grand parties and balls here, but seemingly all but forgot about the old building once the planning of his Greenfield Village commenced. still stands near its original location in Farmington, Michigan. Throughout the 1940's the Botsford was rarely used. However, the restoration bug had bitten Mr. Ford, and it awakened a passion for social history in him like nothing ever had before. 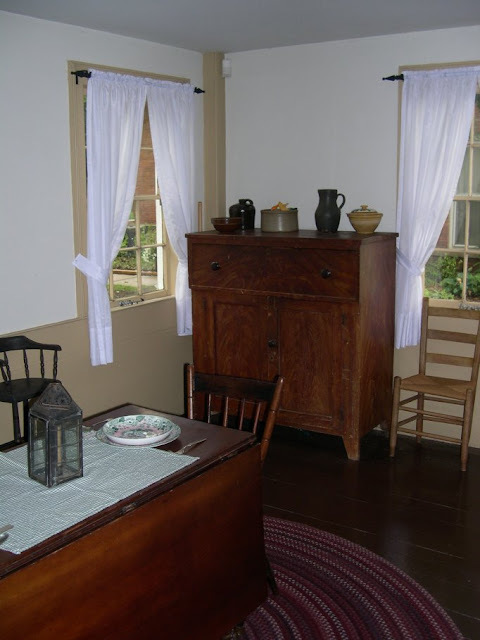 One little known fact was that the city of Williamsburg, Virginia offered to have Ford purchase the more than a dozen colonial era buildings on the original sites in hopes of a financial backing to turn the original capital of Virginia into a living history extravaganza. Ford declined. He felt he had a better idea. Once the decision had been made to build a museum like no other, he decided the land upon which he stored his antique collection would be the perfect spot to build this unique American village, and by October of 1927 construction had begun under chief architect Edward Cutler and the watchful eye of Henry Ford himself. 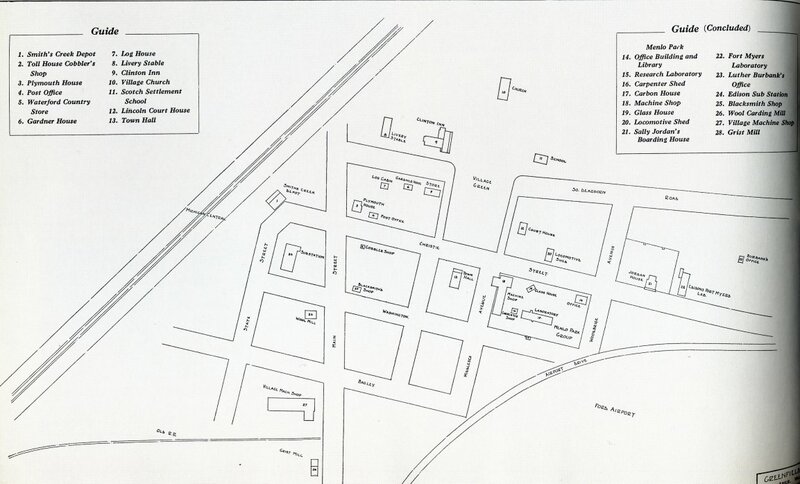 The two men planned the lay out of the village together early in 1927, copying the traditional early American plans of a village green surrounded by a church, town hall, and other buildings. This road should be familiar to those who know Greenfield Village fairly well. Within a few years from when this photo was taken the homes of Chapman, Adams, Webster, and Giddings, as well as the British Cotswold Stone Cottage would be placed on the left, and the Edison home, the Susquehanna plantation, and the Plympton house would be placed on the right. The same road a couple years later. to the right. It's still there, in the same location. 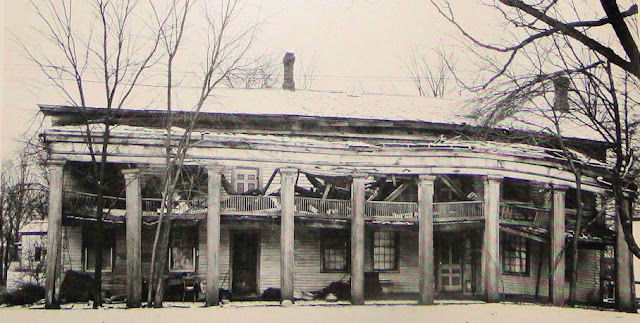 The Eagle Tavern (then christened the Clinton Inn by Ford) has the distinction of being the second structure brought to be restored here, only following the JR Jones General Store (christened by Ford as the Waterford Country Store). The Eagle Tavern was close to being razed before Ford rescued it, thereby preserving pieces of American history that would have been lost. This old tavern was an eyesore to everyone who saw it...except for Henry Ford, who saw early American travel and felt that, even though it didn't belong to anyone famous, it was still important because it showed everyday life of the average traveling citizen of the mid-19th century. ...and thank God he did! What a gem!! 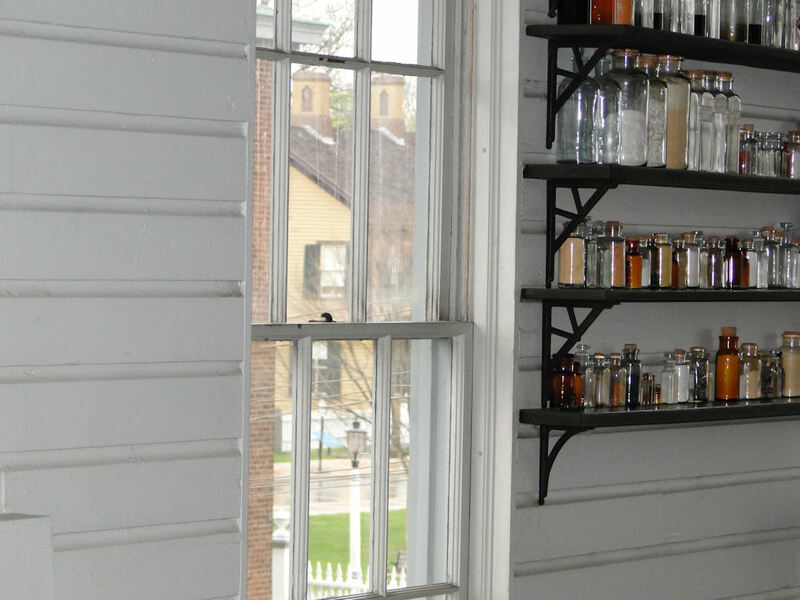 Another preservation is based on one of the most important buildings inside Greenfield Village, the Menlo Park Laboratory. 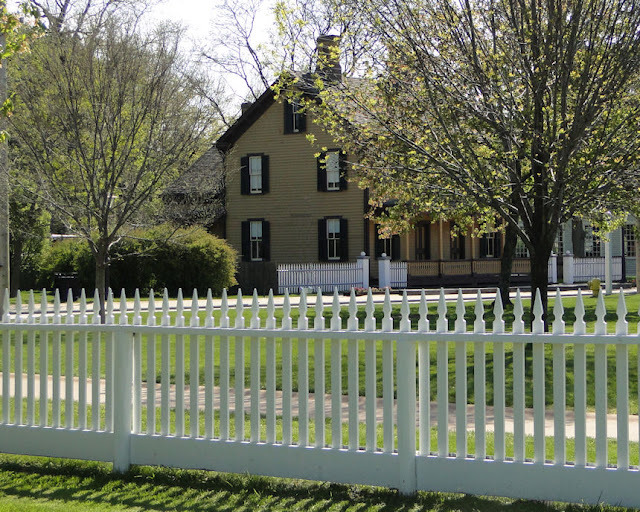 In fact, the opening of Greenfield Village centered around the structure up and beyond all else. Henry Ford, Thomas Edison, and an original Edison helper from the 1870s, Francis Jehl, supervised the reconstruction of the Menlo Park laboratory inside Henry Ford's yet still unopened historic Greenfield Village. This was, perhaps, one of the most important projects in all of modern historical preservation, for it was nearly fifty years earlier when Edison perfected and showed off his working incandescent light right here in this building, and Henry Ford spared no expense in reconstructing the laboratory. You must understand, Thomas Edison was Henry Ford's life-long hero and, as adults, were very close friends. So when Mr. Ford formed the idea for his magnificent museum he knew he wanted to pay tribute to this greatest of all inventors. What better way to do this than to restore the "factory" where so many of his greatest inventions took place? In March of 1928, Ford began the restoration process. He wanted to reconstruct the Menlo Park complex as it was during the period when Edison and his skilled helpers worked at inventing "the future" - 1876 to 1886 - and he wanted it correct in every minute detail. and compare the amount of light produced by light bulbs versus candles. To give a quick bit of history of the lay out of this laboratory, the first floor was used for mainly testing the products as well as measuring and processing. A small cubby was also used for Edison's original office. 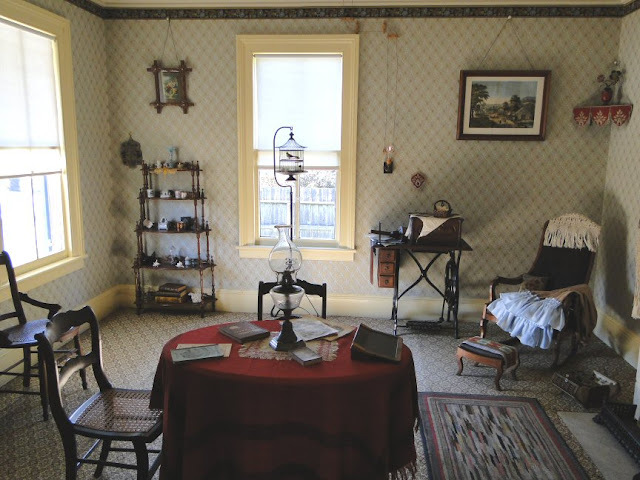 It was on the 2nd floor that the real excitement took place, for it was here that Edison's workers had separate work stations for specific projects, oftentimes working throughout the night on experiments. Edison had a pipe organ installed for entertainment during their few breaks. The men - Edison included - would take turns picking out a tune on the organ while everyone else sang. the organ played in the background? I bet the sounds could be heard clear over at the boarding house! 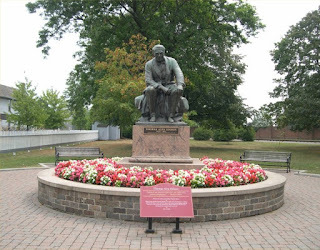 It was unfortunate that the original site was nearly completely dismantled by neighboring farmers not too many years after Edison's move to West Orange, New Jersey in 1887. In fact, it was only a year after Edison had removed himself that cows (kine?) began to wander amongst the buildings of the complex, and a chicken farmer even allowed his flock to make the laboratory their home! Soon after, many local residents began using the quickly dilapidating building's boards to repair their own deteriorating barns and hen houses. A severe storm blew what was left of the building over in 1913. 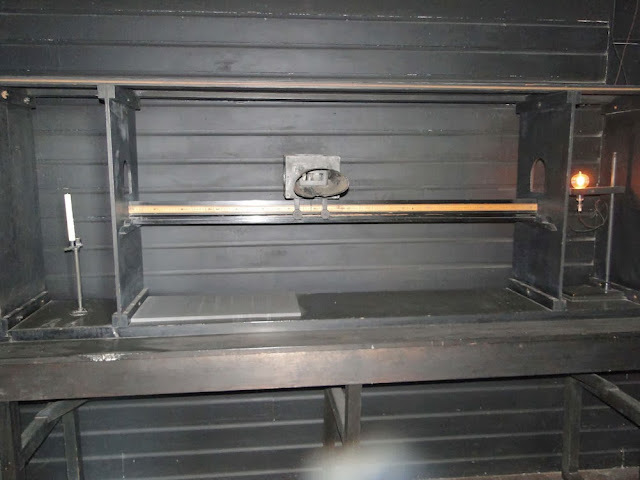 Through the aid of photographs and of the memories of those who worked there, Ford was also able to locate or find exact replicas of the furniture, tools, and other artifacts that once played an important role inside the lab. Once they were aligned in Greenfield Village in the same directional orientation as they were in New Jersey (including carloads of New Jersey clay from the original grounds! ), the buildings became the focal point on what would be called "the greatest and most significant single preservation effort in America." After the restoration was completed (with Francis Jehl's help), Mr. Ford asked Edison what he thought of the reconstruction. Mr. Edison replied that it was 99% correct. Wondering about that 1% that wasn't right, Ford questioned Edison what was not correct. "It was never this clean!" Mr. Edison told him. 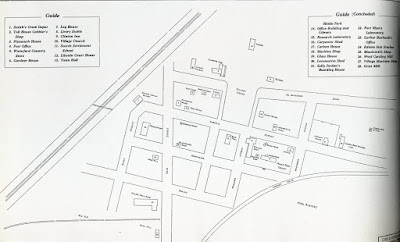 Here is the entire Menlo Park complex, situated exactly as it was in New Jersey. The brick building out in front was the office. Ford even brought tons of New Jersey clay for the structures to sit upon! 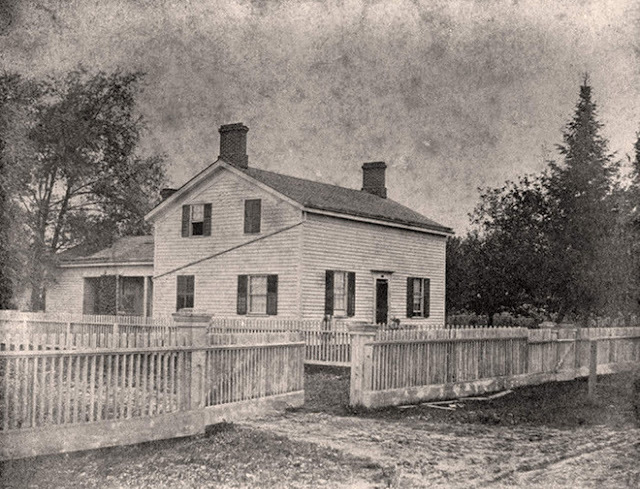 Of the multiple structures that were part of the first actual public demonstration of the electric incandescent light that Thomas Edison gave on New Year's Eve 1879, only one remains, for all others have been torn down: the Sarah Jordan Boarding House. Yep - it's in Greenfield Village, preserved for all the world to see for generations to come. 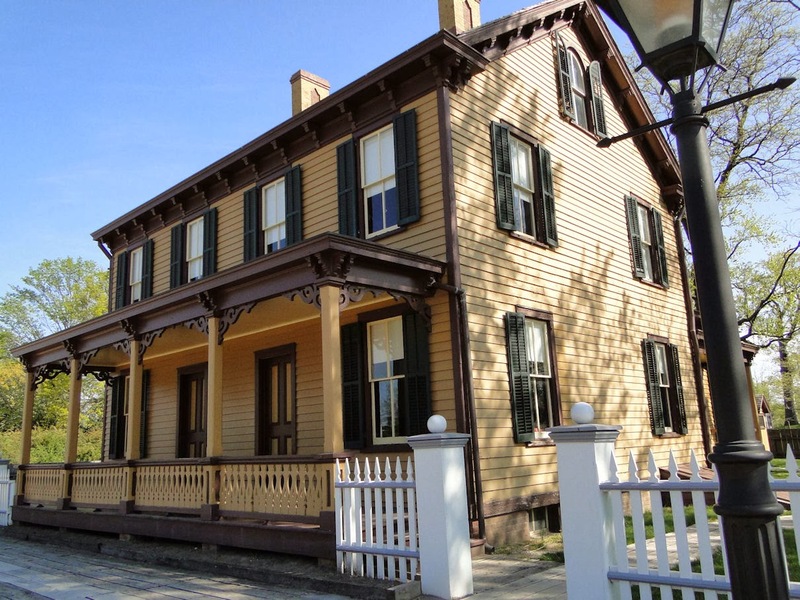 "(Edison) led me to one of the windows to the south end of the second floor and pointed past the office building to a drab-colored frame house with green shutters, a short distance down Christie . I picked up my satchel and made my way down stairs and out the front door. It was nearing the time when Christian folks had supper and went to bed. There was a path leading to the side gate in the rear of the office building. Beyond it stretched Christie Street, running past the picket fence on the east side of the compound. I crossed the street diagonally and...I turned in at the far gate and set foot for the first time on the porch of the Jordan boarding house, which was to become my home for more than a year. In a few moments I was introducing myself to a slight, frail little woman who was the proprietress. The "far gate" that Francis walked through to see Mrs. Jordan. Business was not yet brisk and she was glad to see a new lodger. She escorted me up the narrow winding stairs and into a large room at the front of the home. Although I did not know it at the time, I came later to the conclusion that the room she gave me was the best she had. It looked over the porch and had an additional window on the far side, making three windows in all. 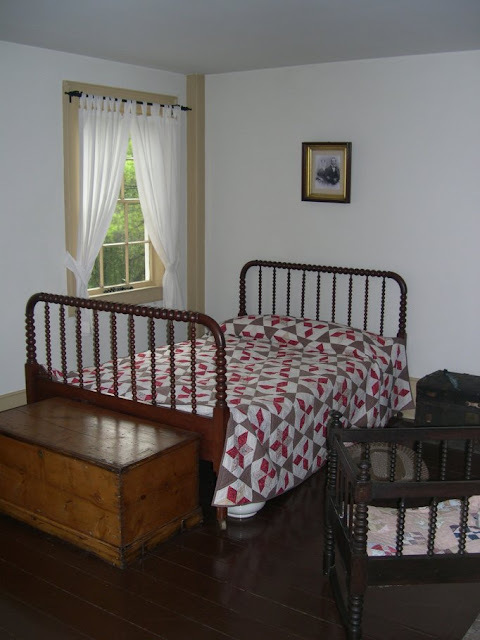 The furnishings were plain but ample - large clean bed, commode with wash bowl and water pitcher, bureau and a few chairs. Board and room, I learned, were to cost five or six dollars a week. I accepted the room at once and after unpacking my satchel by candle light and hanging up my clothes, went downstairs and took a seat in the dining room where two or three men were already at the table. By that time darkness had fallen and a coal oil lamp furnished the light for our supper. Perhaps a brief explanation about the plan of Mrs. Jordan's boarding house might not be out of place here. It comprised two separate apartments, each unit in itself. One was shut apart from the other and the communicating doors were usually kept locked. In one half lived Mrs. Jordan and her daughter, and the other was given over to the boarders. 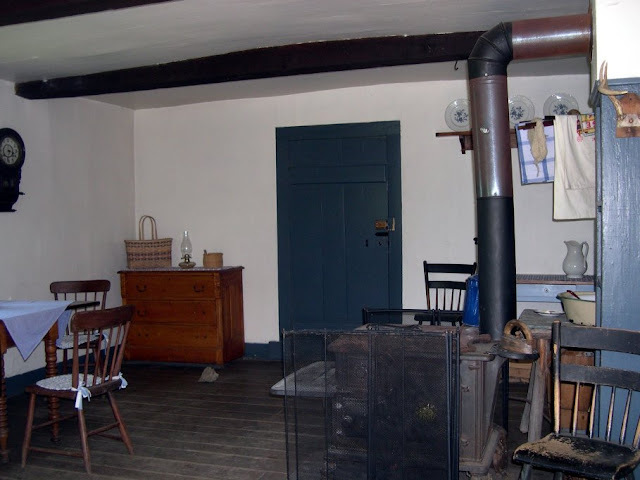 Occasionally the door between the two front rooms downstairs was unlocked and that on the family side was made available to lodgers or visitors as a sitting room. 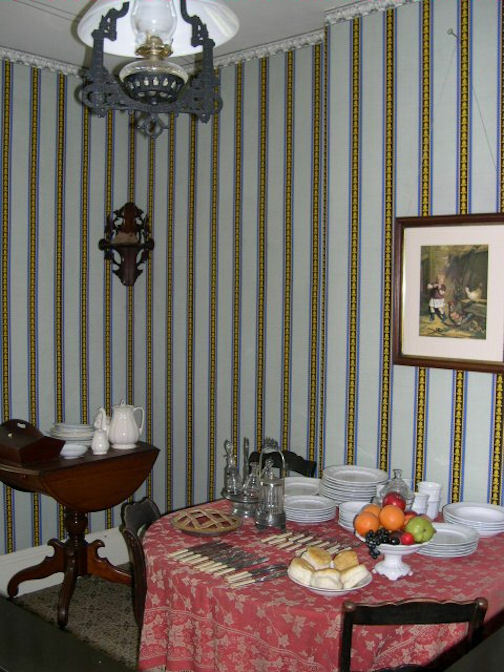 The influx of lodgers taxed the capacity of the little dwelling and it was necessary to use the original sitting room as an overflow dining room to make possible a second dining table at meal time. The whistle, calling the mechanics and workmen to their tasks in the machine shop, blew at seven o'clock in the morning. Those working in the laboratory with Mr. Edison did not follow its summons for they were likely to remain long after hours; but no matter how late they worked the night before, they usually rose early in the morning to be on hand for breakfast. The first who got to the table had the choice helpings and sometimes could squeeze in a second helping before the late comers arrived. Supper was a bountiful meal with meat, vegetables, and fruit framing the main dishes. The big meal of the day - dinner - was at noon when soup, potatoes, and the pies, for which Mrs. Jordan was noted, were served. After the meal we sat for a time in the living room while Mrs. Jordan and her little ten-year-old daughter did the dishes in the kitchen just beyond. Mr. Edison used to walk down the street past the house when he returned home after the long hours at the laboratory. Frequently at night after I retired in my room I heard his footsteps on the walk as he trotted homeward. On such occasions as he passed the house during the day, he stopped to chat with Mrs. Jordan, or with those of us who happened to be loafing on the stoop when the weather was nice." Though it was not dark when I took this photograph, this is very similar to what Francis Jehl saw when he stepped forth from the (Sarah Jordan) boarding house. Yes, that's the Menlo Park complex you see there, and it now sits the same distance as it once did when Mr. Jehl worked there back in 1879. No expense spared to preserve history. So now, with his main buildings in place, including a few not shown here, the fun, after years of planning, could take place. The day's festivities began with Thomas Edison's arrival, escorted by Ford and President Hoover, at Smiths Creek Station now restored in Ford's Greenfield Village. Henry Ford was ready for his tribute to his hero Thomas Edison. It was on October 21, 1929, the 50th anniversary of Edison’s incandescent lamp, that Henry Ford held a gala to honor Mr. Edison and was also the official dedication of the Edison Institute that included Greenfield Village and what became known as the Henry Ford Museum. Some 500 distinguished guests -- family, friends, inventors, business leaders and celebrities, including President and Mrs. Herbert Hoover, Orville Wright, George Eastman, Marie Curie, and Will Rogers -- were invited to this celebration and were able to roam about the Village as well as enjoy the anniversary's gala candle-lit dinner, which would take place inside the replicated Independence Hall portion of the museum building in the early evening. For the opening day of Henry Ford's out-door open-air museum of Greenfield Village, it was, unfortunately, a cool one of rain and fog. His guests, however, still visited the buildings he had restored there, including all of the aforementioned structures mentioned above. Ford provided enclosed horse-drawn carriages to keep his nearly 500 visitors dry between stops. The tour's highlight, of course, was Edison's Menlo Park complex, which was to be the focal point of the evening's Light's Golden Jubilee celebration. 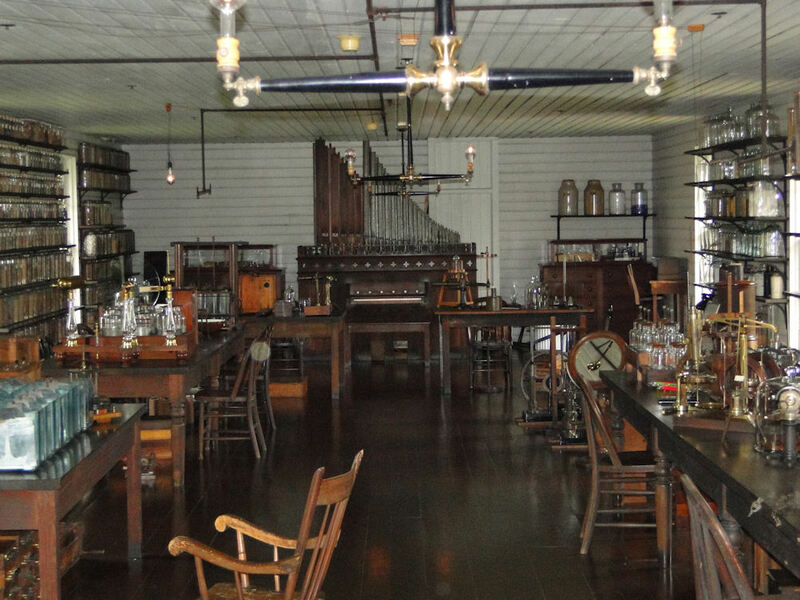 Inside the reconstructed Menlo Park laboratory, Thomas Edison reenacted the events of his first-time ever lighting of his incandescent light bulb 50 years earlier. Included in the festivities was his former assistant Francis Jehl. 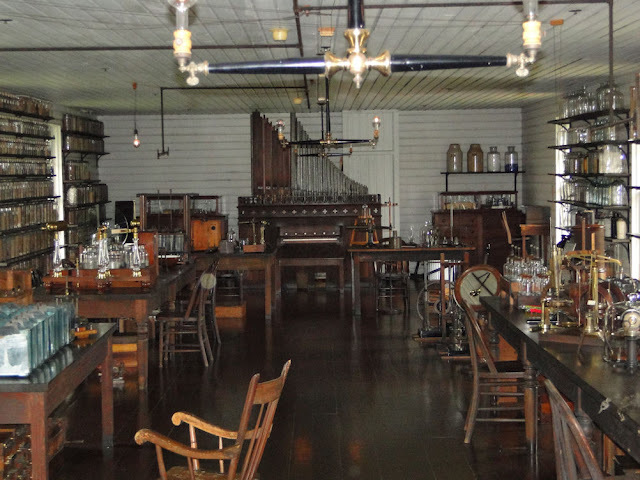 Although the laboratory is not "100%" original, it was close enough to perfect for Edison and his former helpers. Many of the items, the bottles and such, that are now upon the shelves are the very same that Edison had in the laboratory in the late 1870's and early 1880's. The idea that it was in this building (in all reality, it really was in this building when you think about it) that Thomas Edison invented the incandescent light, the phonograph, the stock ticker, a forerunner of the telephone, and over 400 other items, is enough to send chills down one's back upon entering the complex. And so here it was in 1929, exactly fifty years later from that very same October 21 date, in 1929, in this very same building, when Edison reenacted the lighting of the first incandescent light. Henry Ford and President Hoover were right there in the room with him while this event was nationally broadcast on radio. "Will it light? Will it burn? Or will it flicker and die, as so many previous lamps had died? Now the group (Hoover, Edison, and Ford) is about the old vacuum pump. Mr. Edison has two wires in his hand; now he is reaching up to the old lamp; now he is making the connection...It Lights!" The museum's replica of the Liberty Bell pealed for the first time. Electric lights blinked on across the nation; car horns sounded. The world showed it's gratitude - none more deeply than Ford. upon is truly nailed to the floor! 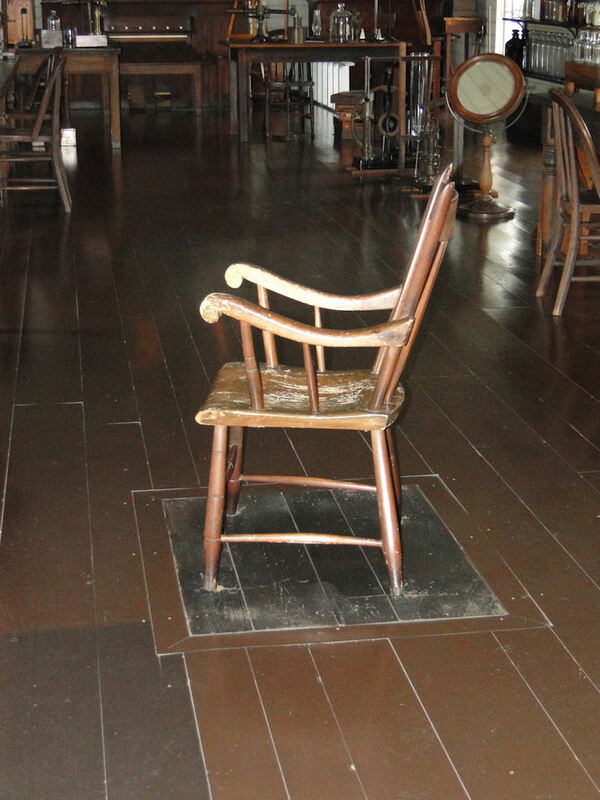 After the glorious moment took place, Ford ordered his men to have the chair upon which Edison sat for the reenactment to be nailed to the floor as is. Menlo Park truly was an invention factory - Edison didn't necessarily invent everything himself; he surrounded himself with the right workers such as Francis Jehl and others who had the right amount of curiosity and know-how, and together, just like the unsung workers in Ford's automobile factory 30 years into the future, came up with the inventions that changed the world. And it still stands, for future generations to see where the future began. Aside from Greenfield Village becoming a place of learning for school-aged kids, as well as special tours for the chosen few, everything inside the serpentine walls stood silent for most people, and the curiosity grew. So, when and how did Greenfield Village finally open up to the general public for the first time? "The public, notified by...articles in the nation's periodicals, knew well that Henry Ford had something going on behind his brick walls. The few curious passersby a day grew to about 400 a day early in the 1930's. By the late spring of 1933, however, a curious public had swelled to nearly 1000. To turn this many people away simply amounted to bad public relations. ...The following recommendations were made...: To operate Greenfield Village in a manner that will permit the visitor to feel as if he or she had been transported back a few years...it should be arranged that they are not herded through in groups with a guide having a set 'lingo' which becomes monotonous and detracts from the true atmosphere of the historic town. Visitors should be charged admission, adults 25 cents, children 10 cents." The book tells of the original plan, on how there should be craftsmen in the respective shops, an old-time hotel keeper at the Clinton Inn, articles and crafts made right there in the village for sale, and food available for the patrons to eat. 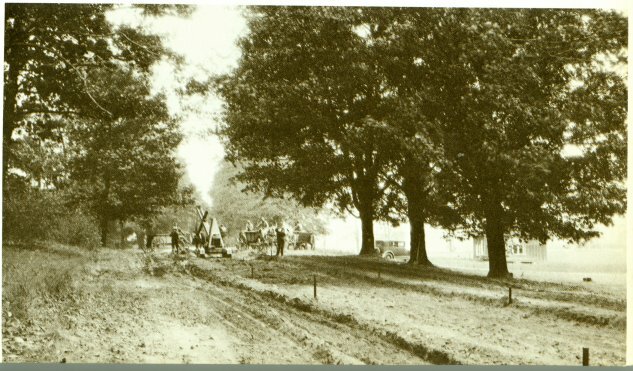 It seems, however, that plans to eventually open the Village up to the public were in mind at least a year earlier for, in the summer of 1932, construction began on the Village gates, a visiting room, and public restrooms. The following year, the "gatehouse" (as it was called) was ready to accept its first patron to pass through into the streets of the past. On June 22, 1933, the first public visitors entered, and the rest, as is said, is literally history in the truest sense! Similar in basic design as the Gardner House (see the next house below the cabin), this 1820's (or 1840's, if the information at Crossroads Village is correct) log cabin met a similar fate as its clapboard counterpart; in 1995 it was moved to Crossroads Village in Flint, Michigan (the Gardner Home removed to the Dearborn Museum grounds). 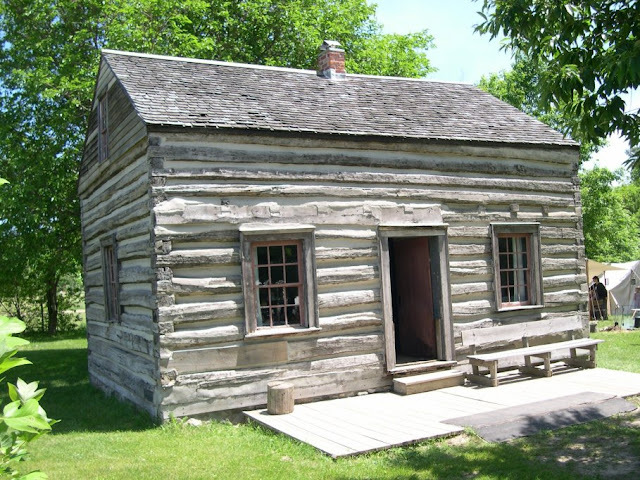 Yes, Michigan had log cabins at one time! 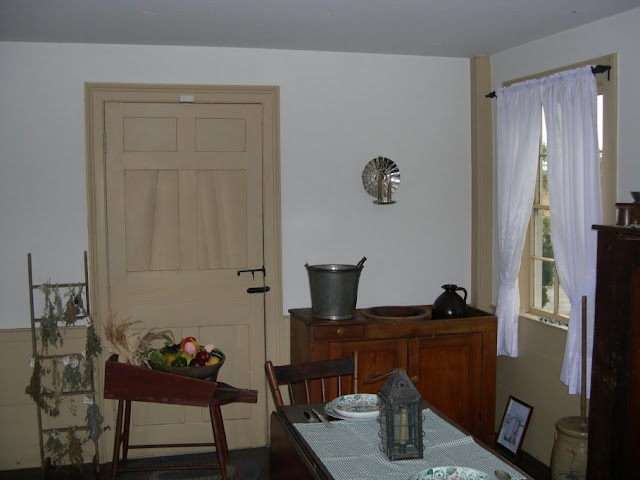 This cabin was originally located about a quarter of a mile from the Ford Farm and had been occupied by John Salter, a German immigrant, of which Ford would visit. Ford architect, Ed Cutler, remembered that the whole structure was originally carted over to Greenfield Village in one piece on a large truck. All the photos here were taken after its removal to Crossroads Village, where you can still see the treasure that once stood inside Greenfield Village. The kitchen area of the cabin. As you can see, the inside walls were completed. Though small, it does not necessarily have a log cabin appearance on the interior. need two, which is why it was donated to Crossroads. I am so very glad it was not taken apart and stored away. Originally located in the Scotch Settlement area of Dearborn Township, the Gardner House was built in 1832 by Richard Gardner, one of the original settlers of the area, and he and his wife - with their ten children - lived in the relatively small house for many years. It was similar to the Pioneer Log Cabin (see above), except that it has the additional refinement of clapboard siding. 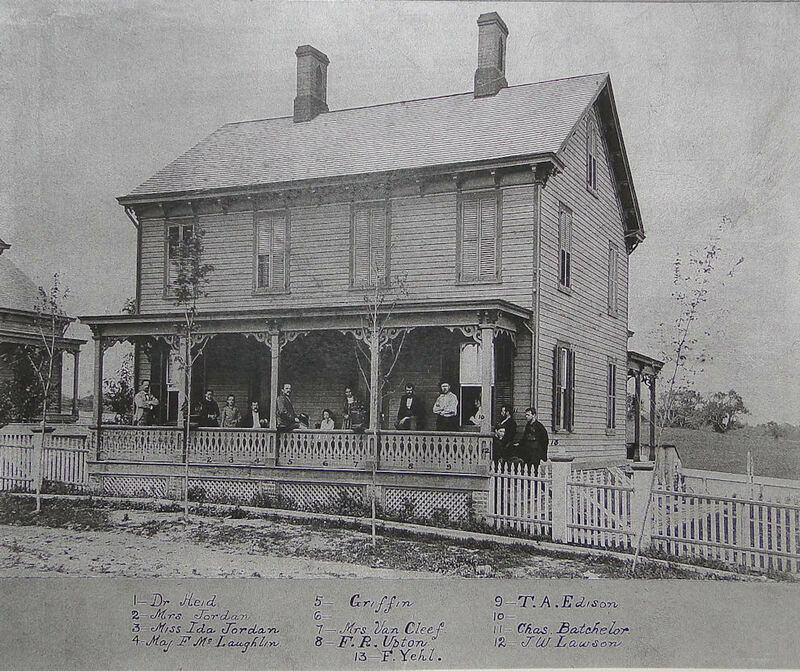 This is such a beautiful representation of an early Michigan home. "This morning I was by a home called the Gardner Home, where, as a boy, I used to frequently stop when I was coming back from Detroit at a late hour. Rather than go on to the house and disturb my father, I would sleep with the Gardner boys. This morning I was by that house because we plan on removing it to the historic village we are about to build." 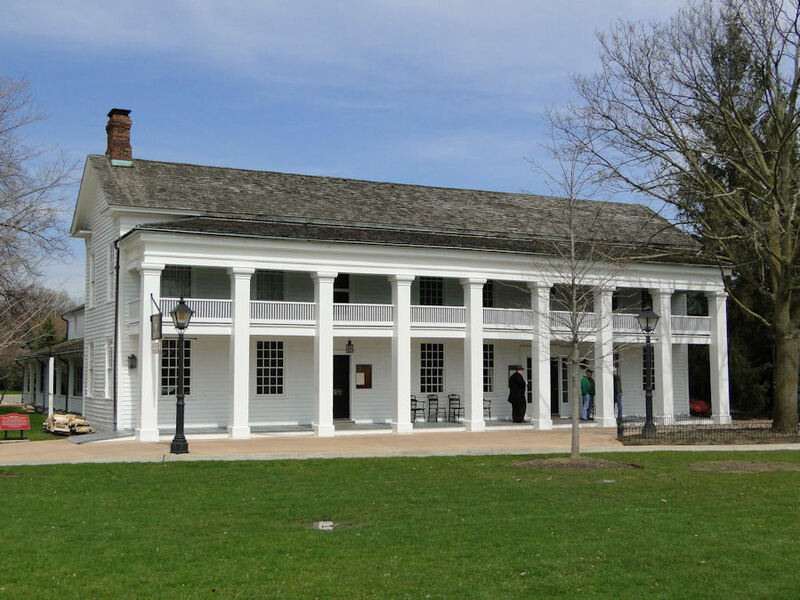 The structure was in place inside Greenfield Village by June of 1929 and remained there until 1996 when it was removed to the premises of the Dearborn Historical Museum, where it can still be visited according to the hours of the society. to its period in time, inside and out. 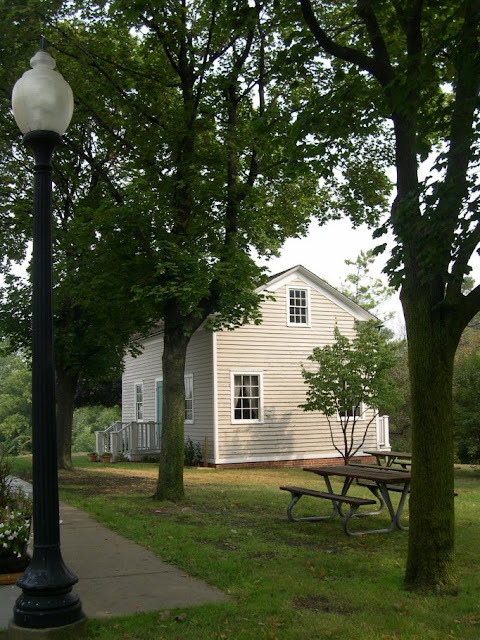 I have not heard why this building, which meant so much to Henry Ford, was removed from Greenfield Village, for it is a very fine example of an 1830s home, something not seen very often. A plus is at least we can still visit this historic structure. 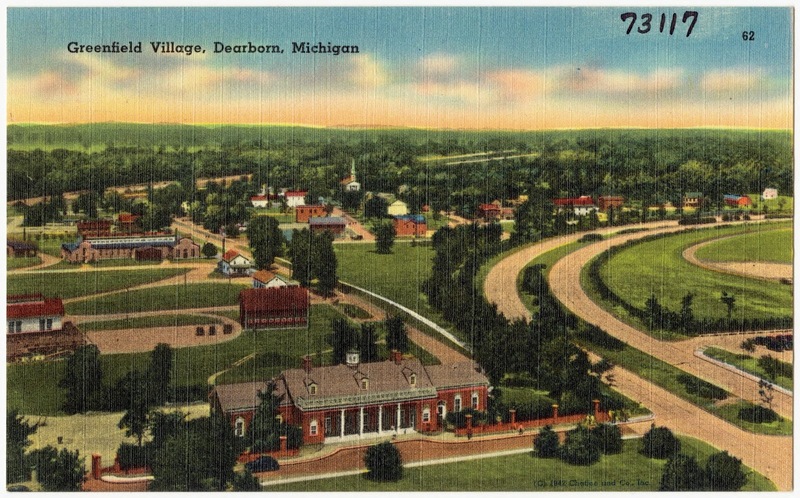 when The Henry Ford gave this structure to Dearborn. 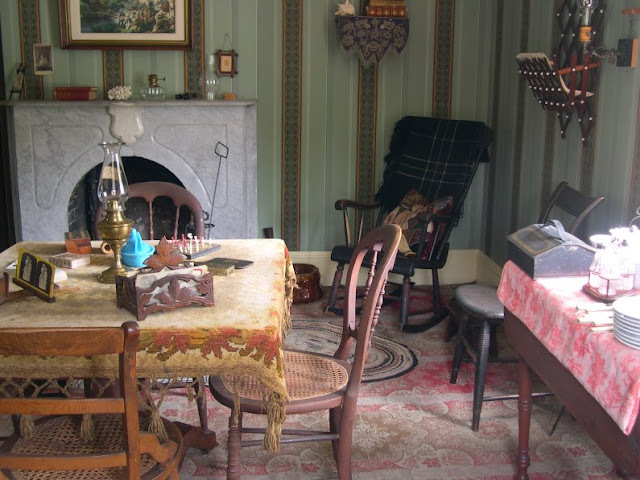 If you live in the Dearborn area and have not ever visited the Gardner House, I highly recommend that you do, for I don't think you will be disappointed. I have visited the Gardner House as it sits inside its new location numerous times, and the Dearborn Historical Museum folks have done a wonderful job in keeping it historically accurate, though I must admit that I very often wish it was still situated inside Greenfield Village, for to see period dress people inside keeping it alive is what I long for. 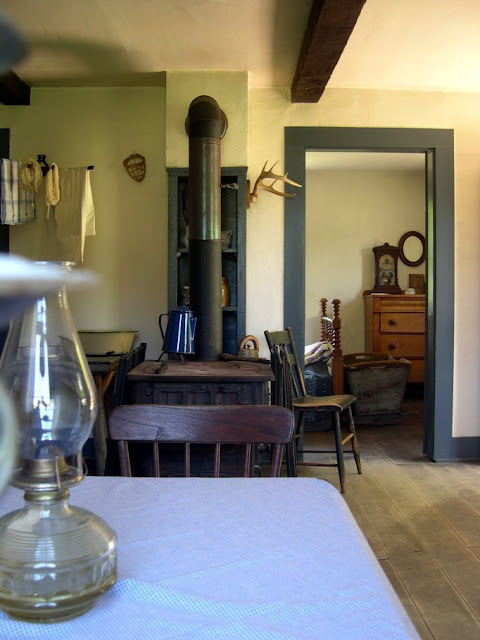 I wish I had taken pictures of both the Salter Log Cabin and the Gardner House as they were inside Greenfield Village, but they were removed before my passion for photography took effect. James Jordan Humberstone, 73, a Chicago resident known for his expertise in antiques and his dedication to the Henry Ford Museum in Michigan, died of heart disease Friday, July 26, in his home. Mr. Humberstone was the only child born in the Henry Ford Museum in Greenfield Village, Mich. His father was the chief curator for the industrialist's living museum and, like many who worked there, the Humberstones lived in the museum quarters. 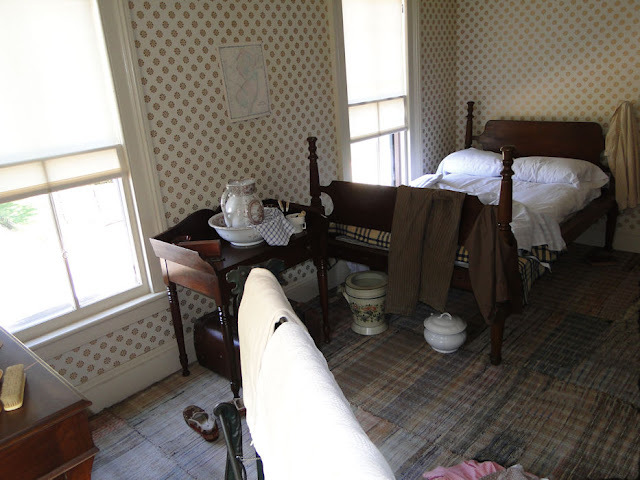 Their home was in the Sarah Jordan Boarding House, which once was the New Jersey residence of Thomas Edison. Ford asked the family to name their child Sarah if it was a girl and Jordan if a boy, said Henry Prebys, Mr. Humberstone's friend and a museum curator. "It's why he went by `Jordan' instead of `James.' He was particularly proud of that." Through my own Friends of Greenfield Village Facebook page I had been proud to become friends with a former very early Greenfield Village presenter, "Robert "Bob" Copp. who died on Sunday, October 28, 2018. He was 97. 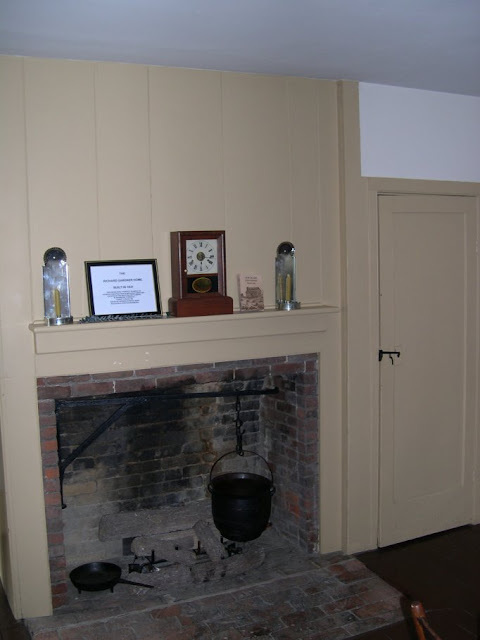 "Robert Copp was also proud of his work as a guide at the Greenfield Village Museum (Dearborn) where he was among the first group hired in 1937. He served in that capacity part time for several years and remained an avid supporter of the Henry Ford Museum, including editing Wikipedia articles and being active on the Greenfield Village Facebook page." I am very proud to have had Mr. Copp be a part of my little Friends of Greenfield Village page. The best part is he was also an active member - he enjoyed giving all of us a little peak into the early days of Greenfield Village. 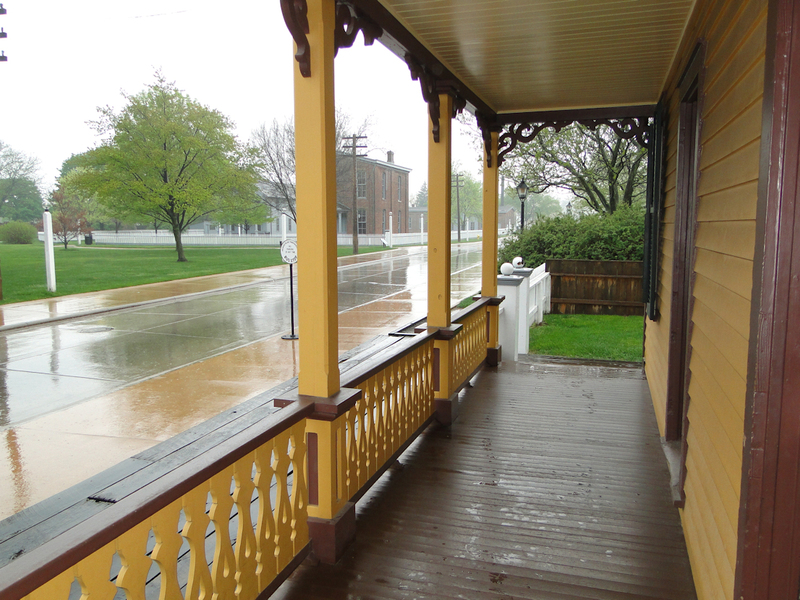 I hope you enjoyed a little trip down Greenfield Village Memory Lane. With that, until next time, see you in time. For those of you that have never been to Greenfield Village, you should plan a trip there. If you are a lover of history, especially American history, this should be on your bucket list. Though the Henry Ford Museum is open year-round, Greenfield Village is open mainly from mid-April through November, with a special Christmas program throughout the month of December. To do it right as a one-time out of town visitor, you will need a minimum of two days...possibly three.